The Zebra P205 m has been discontinued. No direct replacement is available. A Small, Lightweight, Easy to Use Monochrome Card Personalization Printer. Affordable, reliable and simple to use, the P205 m offers outstanding price performance value for monochrome card printing applications. 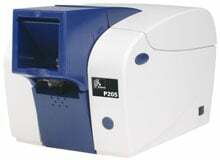 The P205 m prints sharp, readable barcodes, monochrome ID photos and text in seconds. Its space-saving, small footprint along with its unique front loading and card exit design is the perfect choice for desktop and countertop applications. The P205 m is truly user-friendly. The ribbon cartridge is simple for anyone to load and operate. One three-state LED indicator (green, yellow and red) provides easy-to-understand printer status. Printer ribbon synchronization and driver set-up is automatic. An easy to change, self-cleaning cartridge thoroughly removes dust before printing minimizing print quality issues. Every printer comes with a Pocket Guide reference for ribbon loading, cleaning instructions, and error messages. All units ship with product documentation. Dye sublimation/thermal, Single-sided, Monochrome, 300 dpi, Serial/USB interface. Monochrome thermal transfer printing, 4 seconds/card monchrome, 300 dpi (11.8 dots/mm) print resolution, 900 cards/hour for resin black (K), 2MB image memory standard/1MB flash memory, USB and Centronics Parallel/USB and RS-232 Serial interface, Two year warranty. Thermal transfer, 300 dpi, 720 cards per hour, parallel & USB interfaces, monochrome printing, 2MB RAM, 1MB flash. Includes tracks 1 & 2 magnetic stripe encoder & US power cord. Order cables separately. See accessories. Thermal transfer, 300 dpi, 720 cards per hour, parallel & USB interfaces, monochrome printing, 2MB RAM, 1MB flash. Includes US power cord. Order cables separately. See accessories.